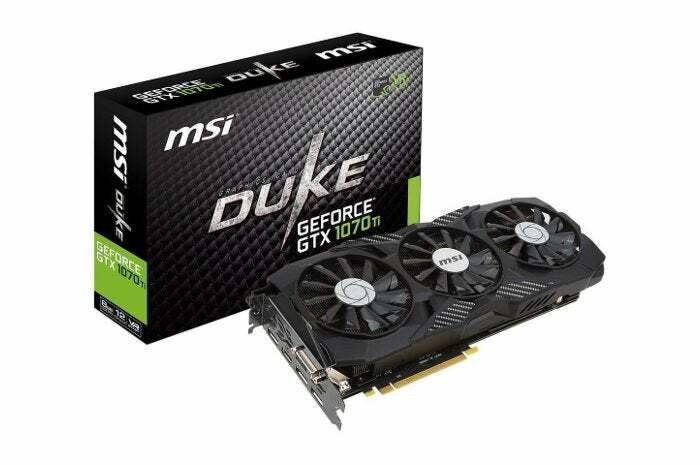 You can get the MSI GeForce GTX 1070 Ti Duke 8G for $420 after checkout code and rebate at Newegg today. The graphics card sale pricing keeps on getting better. Today only you can pick up an MSI GeForce GTX 1070 Ti Duke 8G for $420 with the checkout code EMCSPVRW2 and a $20 mail-in rebate. That makes the up-front cost $445, which is still $45 cheaper than what you'll see for this same graphics card on Amazon right now. As our GPU expert Brad Chacos wrote in our roundup of the best graphics cards, a GTX 1070 Ti is a good card to get for 1440p gaming on fast 144Hz displays. That's why we were so excited in early June when we found the EVGA GTX 1070 Ti SC Black for $470, which was that particular card's MSRP. This deal for the MSI card is even better, considering its most recent price has been closer to $490. It's also significantly cheaper than the earlier sale price of the EVGA. What you get for your money with the MSI is a standard VR-ready 1070 Ti with 8GB of GDDR5 RAM, 2,432 CUDA cores, a core clock of 1,607MHz, and a boost of 1,683MHz. For ports, it's got one DVI-D, one HDMI 2.0, and DisplayPort 1.4. MSI put three fans on this card to keep it cool. To cut down on unnecessary noise, the card also has the company's ZeroFrozr feature, which stops the fans during lighter loads when cooling isn't necessary.